I had some troubles setting up SQLite for my Unity project for Android and iOS app. Let’s hope this quickstart helps you faster up to speed with your mobile app. DISCLAIMER. This example is for OS/X development environment and Android and iOS builds. Never tried this for Windows but I guess installing sqlite3.dll should do the trick. Copy the DataTable.cs and SqliteDatabase.cs somewhere under your projects Assets/Scripts/ folder. If you build also for android, then copy libsqlite3.so in your projects Assets/Plugins/Android/ folder. iOS does not need plugin as it has native support for sqlite. This is the database that should contain the tables you need with any default data you may want to have. Default database is used to bootstrap the actual in app database. Create folder Assets/StreamingAssets/. Then create your default template database with sqlite3. Now you have default database and your project should have files like these. Step 4. Database initialization code. Initialize the database in your main scripts Awake() method. This checks if database already exists and if not, it copies the default db as template. You can use the script execution order setting to ensure that this code is always executed first. Step 5. Use the database! API supports normal selects, inserts and updates. API is simple to use, check detailed documentation from the https://github.com/Busta117/SQLiteUnityKit. Rectangles can have minimum size (e.g. larger than 2×2). First part is defining function that looks up rectangle dimensions. This function starts from a tile that will be left top corner of rectangle and returns its width and height. The listings here are in pseudocode. Function finds the maximum width of the rectangle starting from the left corner and working right (lines 5-6), then it finds rectangle height by looking up rows of same width (lines 11-20). 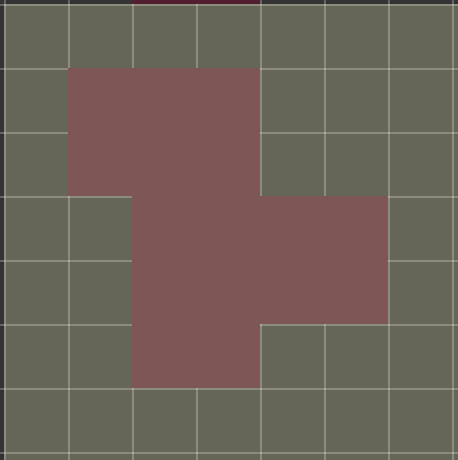 The actual algorithm that finds the rectangles accepts list of grid tiles as input and outputs the found rectangles that are maximally sized. The pseudocode listing here assumes some helper functions for simplicity. Listing 2. Find maximal rectangles. Unoptimized for readability! # sort with compare order by y and x. 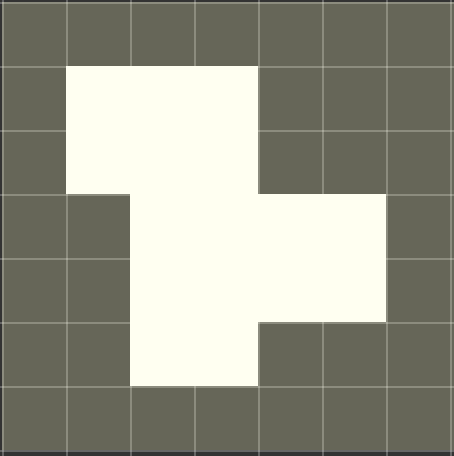 Here is example how the algorithm works, here white area presents the working set of tiles that algorithm works on, white presents the tiles that are in list tiles. Algorithm sorts first the tiles in top-to-bottom and left-to-right order so it starts from top left tile. 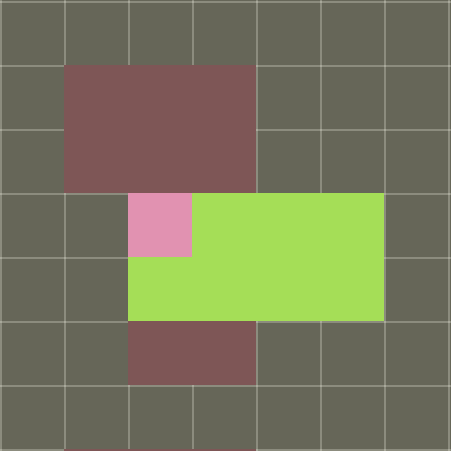 The pink denotes the current working tile c. The green represents the tiles that belong to rectangle as determined by call to get_rectangle_size. Next step is to remove tiles from working set that can not be part of any other rectangle. This is determined by checking if the row and column of tile are bounded inside the current rectangle. The purple presents tiles that were removed from the working set tiles. Found rectangle is added in the list rectangles if it’s large enough (in this case larger than 2×2). Then loop is executed again with next corner tile c.
Next iteration of the main loop returns another rectangle and closed tiles are removed and rectangle added to list. Final loop of the rectangle. There are no more tiles to work so main loop stops. 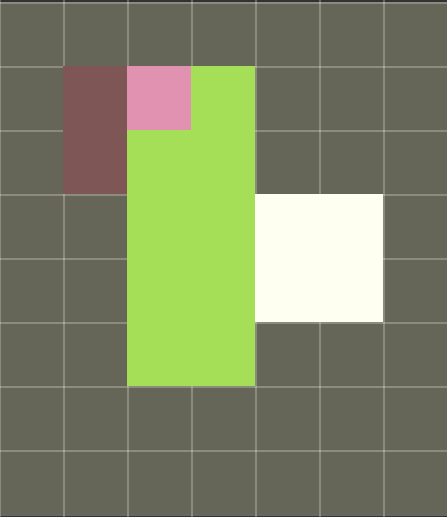 Finally algorithm sorts the found rectangles in descending surface area order and removes overlap. The resulting rectangles are returned as output. Games need to store some persistent data like high scores and progress between the game sessions. Fortunately Unity gives us PlayerPrefs class that is essentially a persistent hash map. Reading and writing values with PlayerPrefs is as simple as calling get and set. It has its limitations, only strings and numbers can be stored and that makes more complex data lot more difficult to maintain. What we can do is to write simple utility that can be used to serialize classes to strings that can then be read and written with PlayerPrefs. SerializerUtil is static class with two methods to Load and Write object. In case loading fails it returns default value of the data, usually null. To load and save your classes, declare them as Serializable. You can then easily store instances of the class. Classes can be also more complicated, you can add member functions and also exclude some member variables from serialization. It’s also possible to define member function that will be called after serialization, it’s good way to init class after deserialization from disk. This serialization does not support versioning. You can not read the stored instance anymore if you change the class members as the LoadObject will fail to deserialize the data. You need to add following environment variable to force Mono runtime to use reflection instead JIT. Otherwise the serialization will fail on iOS devices. Do this before doing any loading or saving of classes. Managing game data in Unity scene objects can get really painful especially when more than one people needs to edit the same thing. It’s usually better to have some data in CSV file where it can be controlled centrally. When facing this problem I couldn’t find CSV reader for Unity that would have been exactly what I need. i.e. not be very buggy, huge or require new assembly dependencies. So here is very simple CSV reader for Unity. It is bare bones but still robust enough parse quoted text and comma’s inside text. Reader assumes that csv files are in Resources folder of your Unity project. Drop this in your Scripts folder as CSVReader.cs and make folder Resources under your Assets folder. Put there any CSV files you want to use. Example CSV file example.csv in Resources folder. cat,2,4.5,"cat stalks, jumps and meows"
Some time ago I was presented question if there would be easy and quick way to recognize certain usage patterns in huge amount of event data. The events in question were common user activity like clicking buttons, waiting certain time between and so on. This data could then used to improve user experience or catch cheaters that write bots to play their game for them and so on. Here A could be button click to open window, B a tab click in window, C close button, 1 a second pause before moving mouse, 2 a few second pause before moving mouse and X is collect resources etc..
Function accepts two arguments, the list of symbols and flag if trivial pattern should be accepted. This is needed to determine if you consider a input list “AAAAA” to be one instance of pattern “AAAAA” or 5 instances of pattern “A”. When this function is applied on the example string above, we get list of core patterns and the input as pattern list. Here it’s easy to see that the string is composed of two main patterns, ABC123 and ABC123X. The second output list is the input string split as instances of pattern. Real data is noisier than the example here, so proper data cleaning and event definition / filtering are vital for any kind of useful pattern recognition. Going forward we can also define function that recursively uses the output of the findpattern to find patterns of patterns up to the “prime” pattern of the input, i.e. the pattern that when repeated N times produces the original input string. And indeed the input string is the prime pattern ABCABCDEABCABCDEABCABCDEXABCABCDEABCABCDEABCABCDEXO concatenated 4 times. Note effect of parameter trival on the function. Former is single instance of pattern “AAAA” and latter is 4 instances of pattern “A”. Let’s consider following requirement. We have list of objects, say questions, that we want to show our users. Let’s also assume that the list is very long, 500 messages. show each question only once for each user. show the questions in different order to each user. Each user responds to only few questions each day so it will take several months before they exhaust the list. We need to remember over each session where user left off. Basic way to implement this is to take the list of questions, make a copy of it, shuffle it’s content and save it as part of users profile data. This has obvious drawbacks of the data duplication and maintenance. Also if the list changes, every single copy of the list has to be updated. Cheaper way to implement this is to use prime walk. In this method we can keep only single copy of the list and store only number of answered questions in the users profile. First define the list, say we have 500 items. Find prime number that is greater than 500. For example 503. Select seed for each user. This seed is any number that is constant for an user, like user id or time of account creation. Then we define function that uses these values. Note that this implementation is tail-recursive for code simplicity, efficient implementation should not use recursion. Function returns items from list in different order for every unique user id. Only thing needed to keep track of progress is to store the number of questions user has answered. Changing list requires some care. To delete question, just mark the entry in list to null to skip it. To add questions, add another list that is used after user has exhausted the original one. If you change the list length, the order of selection changes and it’s not anymore guaranteed that user sees every question and sees every question only once.